With the purchase of additional licenses, you can keep everyone on your team up-to-date by using UDA ProjectSync included in the UDA SyncCenter. Now everyone is informed of changes in project budgets, schedules, and materials. Desktop. Laptop. It's all there. Although the primary means of sharing information when you purchase additional licenses is to have multiple users log in to a single database, UDA ProjectSync has you covered when it's necessary to work outside the office network on a laptop or tablet PC. Synchronize information on your desktop and laptop computers, so that you have the data you need whether you're at the office or the job site. 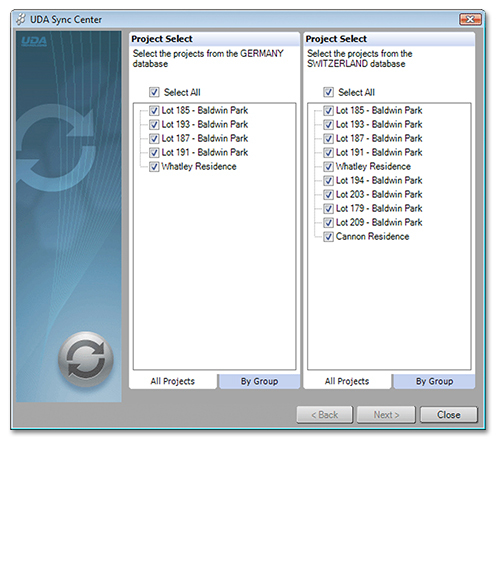 Choose which projects to synchronize and what computers to include. Synchronize on demand for instantaneous information sharing. Schedule daily or weekly synchronizations to ensure that each computer always has the latest information. 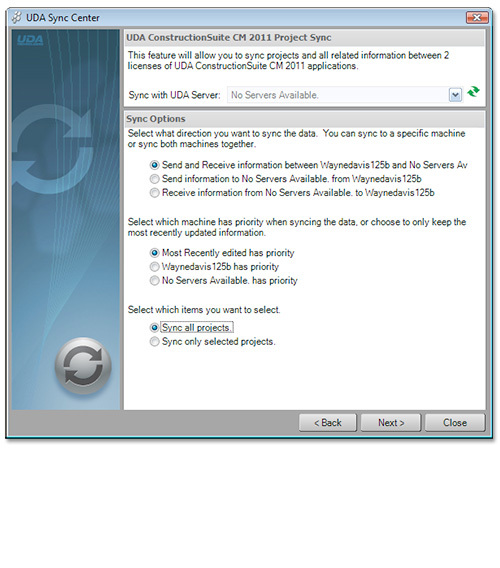 Now you can manage all of your Syncs - ProjectSync, ContactSync, AppointmentSync, and TaskSync - from one location within the UDA SyncCenter. Set your preferences and schedule your syncs so you will always have the information you need when you need it. You need your data at the office and on the go, and you need it to be updated and correct. 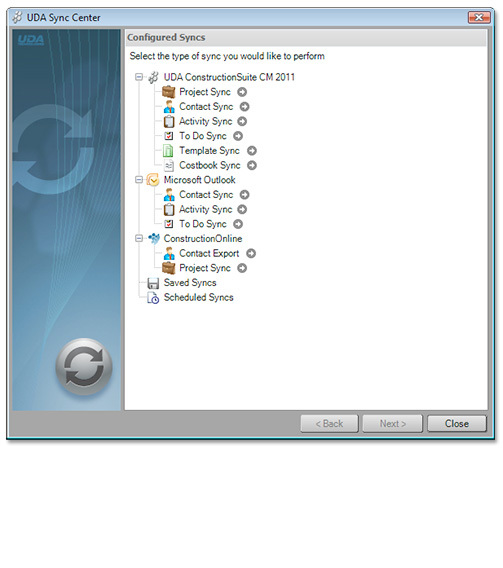 Synchronizations performed through UDA SyncCenter will cross reference project and project-related information, contacts, and templates stored in the ConstructionSuite database. Synchronize your business with UDA ProjectSync, included FREE with the purchase of any ConstructionSuite additional licenses.